There is a wide variety of animals living on the Arctic seabed. Attached to rocks, they feed by removing nutrients from the water using filters or tentacles. But it can take decades for these colonies to become established, and they probably don't achieve their natural diversity until much later. These are the findings of a unique 18-year study by researchers from the Alfred Wegener Institute Helmholtz Centre for Polar and Marine Research (AWI), which has now been published in the scientific journal Limnology and Oceanography. Some sponge species stand on rocks like Roman vases, while the tentacles of feather stars (comatulida) and sea lilies sway elegantly in the currents. When remotely operated underwater vehicles travel around the bed of the Arctic deep sea, their cameras regularly capture images of these sedentary creatures. One of the most important habitats for these organisms is the so-called "dropstones—rocks and boulders that are incorporated into glaciers on land and then transported out to sea. Once the ice melts, the rocks sink to the seabed, where they provide precisely the hard substrate that many of these species require. But how long does it take before the first settlers in the Arctic deep sea take advantage of this? And how does the community develop further? "Until now, we knew next to nothing about this," explains Michael Klages from the AWI. A few studies have investigated these questions in the Antarctic, but they focused on the shallow sea areas, where the conditions are different. Now, there are new findings from the deep-sea observatory HAUSGARTEN, located in the Fram Strait between Svalbard and Greenland, where the AWI conducts various long-term ecological studies. 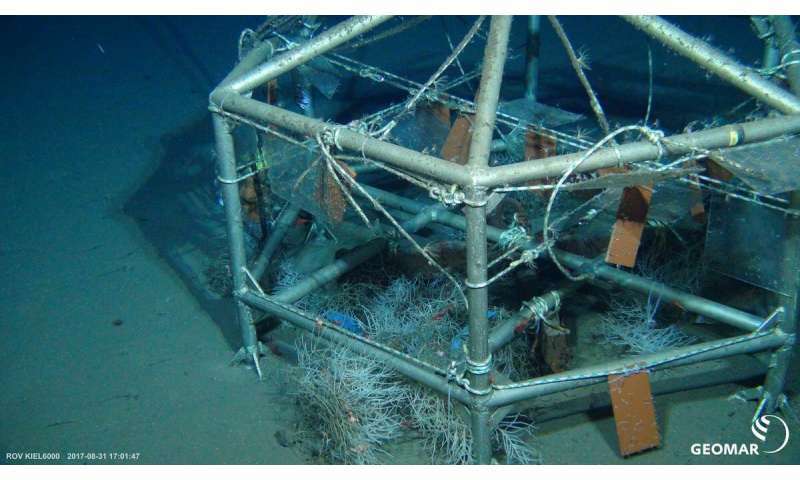 In July 1999, Michael Klages and his colleagues from the AWI's deep-sea research group placed a heavy metal frame on the seabed at a depth of 2,500 metres. So-called settlement panels made of clinker bricks, Plexiglas and wood were attached to the frame to offer possible substrates for sedentary deep-sea inhabitants. Then it was a case of waiting to see what happened. In 2003 and 2011, the team sent a remotely operated underwater vehicle to the construction, and in late August 2017 the frame was finally brought back to the surface. The first author of the recent publication, Kirstin Meyer-Kaiser, who now works at the Woods Hole Oceanographic Institution in the US state of Massachusetts, had the task of carefully examining the settlement panels. This involved counting, collecting and taxonomically classifying the individual organisms. "In this investigation we saw that colonisation of such habitats in the Arctic deep sea occurs extremely slowly," summarises Michael Klages. After four years, only single-celled organisms belonging to the foraminifera were found on the panels, and after twelve years the polyp Halisiphonia arctica was the only multicellular animal present. Even after 18 years, there were only 13 species of multicellular invertebrates. However, despite the low diversity, the researchers haven't concluded that natural solid substrates are not an important habitat—on the contrary: "Without them, a number of sedentary animals wouldn't exist in the Arctic deep sea," stresses Michael Klages. But the waste products of civilisation that are now ubiquitous in the oceans don't appear to be a good substitute—despite the fact that the AWI team have seen a sea lily growing on a plastic bottle in one of the pictures taken by the remotely operated underwater vehicle. "That's what gave us the idea of using Plexiglas in our experiment," the researcher explains. "We wanted to see whether it could be colonised just as well as a near-natural substrate." Apparently that's not the case. At least, after 18 years significantly fewer animals were found on the plastic than on the clinker bricks. But the latter couldn't compete with a nearby rocky reef, where 65 different invertebrates were identified. It is possible that even almost two decades isn't long enough for the panels to achieve their theoretical species diversity. The rocky reef mentioned is considerably older in comparison, and so has had more time to attract a wider range of inhabitants. The findings provide important insights into the sensitivity of deep-sea ecosystems. "If disturbances there destroy the sedentary inhabitants of the seabed, it can take decades for the colonies to recover," says Michael Klages. In the Arctic, such disturbances could occur as a result of fishing, or drilling for oil and gas. However, much more far-reaching consequences are to be expected, e.g. in the depths of the Pacific, where large-scale manganese nodule mining is planned.